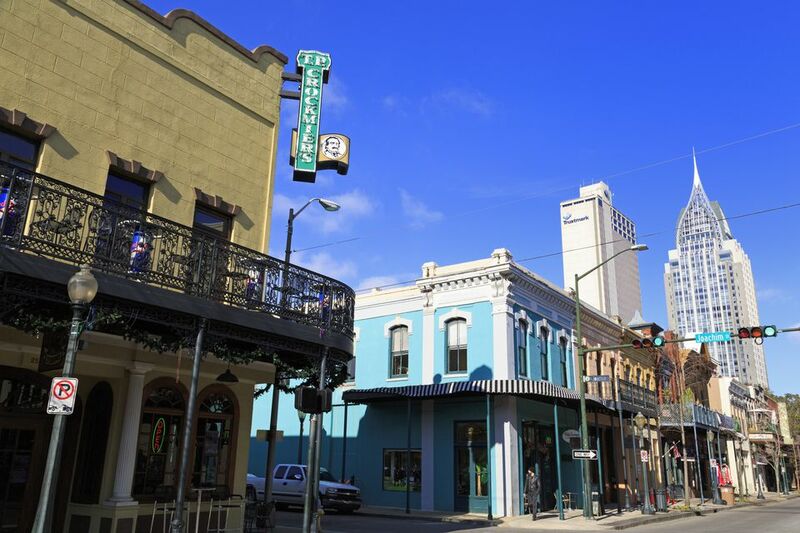 Famous for its historic sites, bay-front location, vintage buildings with wrought-iron balconies, and one of the nation's most popular Mardi Gras celebrations, the southern Alabama city of Mobile is has a small but very fun little gay nightlife district. Most of the city's LGBT bars are in the heart of downtown, steps from the moss-draped live oak trees of Bienville Square, the acclaimed (and beautifully restored) Saenger Theatre, and such first-rate hotels as the historic Battle House Renaissance Hotel, the Renaissance Riverview Plaza, the Hampton Inn & Suites (one of the nicer ones you'll ever find), and the charming Malaga Inn. The scene here is considerably more discreet than in New Orleans, but charming Mobile does make for a very fun weekend getaway, and the city also hosts a lively Gay Pride celebration each April. There are three gay bars in downtown Mobile, all of them around the block of Conti Street from Joachim to Conception streets. B-Bob's (213 Conti St., 251-433-2262) has been going strong since the early 1990s and has two levels. On the ground floor, there's a more conservation-friendly bar, while in the convivial upstairs area there's dancing, drag cabaret, and more of a high-energy vibe. The owners also operate the newest gay bar in the city, Flip Side Bar & Patio (54 S. Conception St., 251-431-8869), which draws many of the same who hang out at B-Bob's. Pluses here include the fact that it's a smoke-free bar inside, and that there's a pleasant patio (where you can smoke, but it's also just a great place to socialize and enjoy mingling on a warm evening). Flip Side was formerly known as Bacchus. Just around the corner, Gabriel's (55 S. Joachim St., 251-432-4900) also dates to the early 1990s and is set inside a charming old building with exposed-brick walls and a beautifully kept patio. Gabriel's is a private club, meaning they're able to serve liquor later than at public establishments, but also that you must be a member of guest of a member. This lively bar has a great staff, including a few feline mascots rescued by the human employees. Gabriel's is fun for karaoke, socializing around the cozy bar, and shooting pool, and on Saturday nights, the attractive patio is the place to be. Mobile does have one other gay neighborhood bar, Midtown Pub (153 S. Florida St., 251-450-1555) that's not right in the downtown district but, but is just a 10- to 15-minute drive west, in the area for which it's named. With plenty of parking, pinball machines and pool tables, a decent-size dance floor, and an everybody-knows-your-name kind of vibe, this is an easy place for newcomers to fit in. Sunday's karaoke nights are fun, and every night you can count on a couple of drink specials. The crowd is eclectic and friendly. Mobile is a great city for seafood and Creole cooking, and several restaurants downtown do cultivate a bit of a gay following and are well worth checking out for a meal or to grab a drink. The following spots are all within a short walk of downtown hotels as well as the gay bars near the Saenger Theatre. Sophisticated Noja (6 N. Jackson St., 251-433-0377) serves some of the most creative and artfully plated food in the city, including sous vide salmon with gnocchi, braised red cabbage, and a morel mushroom sauce; and Indian-spiced grilled lamb loin with garlic and onion confit. Since 1938, Wintzell's Oyster House (605 Dauphin St., 251-432-4605) has been turning out delicious Creole-inspired seafood and other dishes - this one in downtown Mobile is the original of what's become a sizable chain with franchises throughout Alabama. Popular with the gay community and occupying an elegant, historic building, Spot of Tea (310 Dauphin St., 251-433-9009) serves three meals a day but is especially well-regarded for brunch and breakfast (the banana's Foster French toast has plenty of fans). Quirky and fun, serving fusion Mexican and Japanese food, the OK Bicycle Shop (661 Dauphin St., 251-432-2453) cultivates an offbeat vibe and caters to a happily diverse bunch - it's a good bet for cocktails, too. Nearby Hayley's Bar (278 Dauphin St., 205-433-4970) has a great list of hard-to-find beers and a funky feel about it - it's a straight hangout, but with a pretty mixed crowd, from hipsters to artists to suits. It's just an hour's drive southeast to the Florida panhandle city of Pensacola, home to​ a few other noteworthy gay bars, as well as the Pensacola Gay Memorial Day Weekend celebration, held each year in late May.